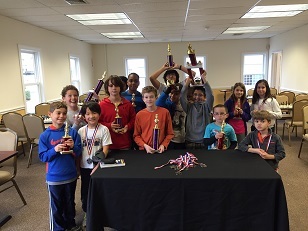 This month's K-8 section was won in spectacular fashion by Dream Teamer Giacomo Lowenstine. Giacomo impressively defeated three players significantly higher rated than him to take sole first place! An unusual finish occurred in the K-5 section as three players tied for 1st! Another Dream Teamer, Aaryan Chitnis, took first place on tiebreaks. Nicholas Kurbanov and Jacob Green were the 2nd and 3rd place co-champions respectively. 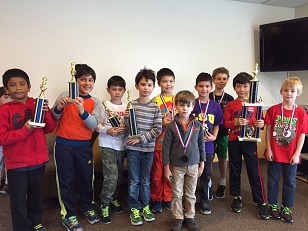 Int he K-2 section Max Ingargiola was won the section. Max was the only player of the day to finish with a perfect 4/4 score! CCFC also welcomed a large group of players participating in just their first or second tournament. Congratulations to all of the participants on a well played tournament.